Why anyone would go to the trouble of gathering a bunch of severed zombie limbs into a bag during a zombie apocalypse is anyones guess. But it was done, and now you can use the Bag of Zombie Limbs to suit your own horrific needs. This bag is filled with four different appendages, each of which features an inhuman dark blue and gray coloration that one would expect to find on a zombie. The bag contains one hand, severed at the wrist, one foot, severed just above the ankle, one arm, severed just below the elbow, and one leg, severed just below the knee. Each limb features dried trails of blood along the skin, as well as gory, blood-red stumps with segments of broken bone protruding out of them. Each of the appendages in this bag is made from molded plastic. The arm and the leg measure approximately 18 inches long, while the foot measures 10 inches tall and the hand measures 9 inches long. 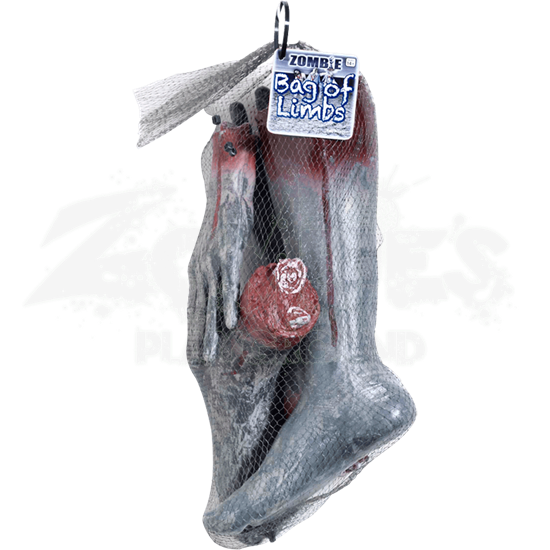 Break open the Bag of Zombie Limbs and scatter the contents with a splattering of blood to create the scene of a zombie massacre, or use the limbs creatively in your zombie costume in order to make limbs that can be torn away without damaging your work.